As a young lawyer in his first job out of law school, John Ciorciari made a choice that would alter the trajectory of his professional career. He had been the editor-in-chief of the Harvard International Law Journal and specialized in international financial transactions at a big law firm. Then Ciorciari heard about a center in Cambodia that was compiling evidence to promote justice for Khmer Rouge atrocities. He offered to help. By the time Ciorciari came back to the law firm six months later he had caught a bug — both figuratively and literally. “It was such an eye-opening and exciting experience to go out in the field,” Ciorciari says. Even contracting typhoid was not enough to dissuade him. He continues to work pro bono as a senior legal advisor to the Documentation Center of Cambodia and has written a book and numerous articles on the processes of accountability, justice, and reconciliation in the country. The experience would inspire him to pursue a doctorate in international relations at Oxford to better understand the many different political constraints in a process like Cambodia’s. It also led him to work for the U.S. Treasury Department’s Office of International Affairs, where he focused on the economic development angle in post-conflict countries. 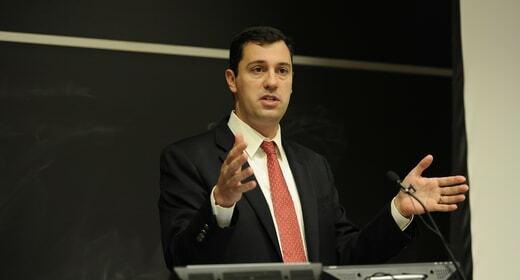 Now, as the director of the new Weiser Diplomacy Center, Ciorciari wants to enable students at U-M and the Ford School to become similarly engaged. The initiative, made possible by a $10 million gift from University of Michigan Regent Ron and Mrs. Eileen Weiser, will provide training to students for careers in international affairs, help generate contacts with the foreign policy community, inform academic research, and reach the broader public bringing high-profile speakers and events to campus. “One thing the Weisers want to accomplish, which I support wholeheartedly, is to give our students the encouragement and support to go out and learn about questions that they find inspiring and important,” Ciorciari says. Opportunities to get outside their home countries to engage with and learn from partners in other societies will allow students to build expertise early on in their careers. While many of the programs that focus on diplomacy in the United States are clustered around Washington D.C., being located at the University of Michigan confers distinct advantages, says former ambassador Melvyn Levitsky, who is a professor of international policy and practice at the Ford School and senior advisor to the Weiser Diplomacy Center. A key asset is the university’s breadth and depth in relevant academic areas: one of the richest programs for area studies in the country, as well as outstanding social science, and language studies.“We have a terrific menu to draw from because of the broad university strength,” Levitsky says. “We want to bring those sets of expertise together and find useful applications of academic knowledge to foreign policy,” Ciorciari says. To do so, the Weiser Diplomacy Center will emphasize the processes involved in international affairs. While academic researchers might ask why opium production has been so resilient in Afghanistan, for example, a policymaker has to figure out how to make the best dent on the problem with limited resources and without sacrificing other priorities. “It is a very different analytic process,” Ciorciari says. Policymakers have to identify the other stakeholders and their interests and reflect on how to frame the problem and set the agenda in relevant institutions and develop policies that can be implemented effectively. To bring this approach to the forefront, new professors of practice in international diplomacy and visiting diplomats will draw from their experiences to illustrate how diplomatic process and contextual factors relate to policy outcomes. Skill-building workshops and simulations will complement the practical focus. In turn, Ciorciari believes that the close contact with experts in the field will also inform academic research. “If we want our research to impact diplomatic practice, we have to be answering questions that people on the front lines of foreign policy care about,” he says. The hope is also that the diplomatic hub can eventually benefit the international affairs community more broadly. To that end, the center will engage regional actors with interests in U.S. foreign policy. “We want to position ourselves to address issues where we have comparative advantages,” Ciorciari says. Events tackling trade, migration, and climate change, for instance, will involve partners in the University of Toronto and the National Autonomous University of Mexico, as well as participants from the auto industry or the Great Lakes Commission. Below is a formatted version of this article from State & Hill, the magazine of the Ford School. View the entire Winter 2019 State & Hill.